Crews are widening the road into two lanes and adding a paved shoulder as a bike lane. OLDSMAR, Fla. — Work is beginning Monday in Oldsmar. 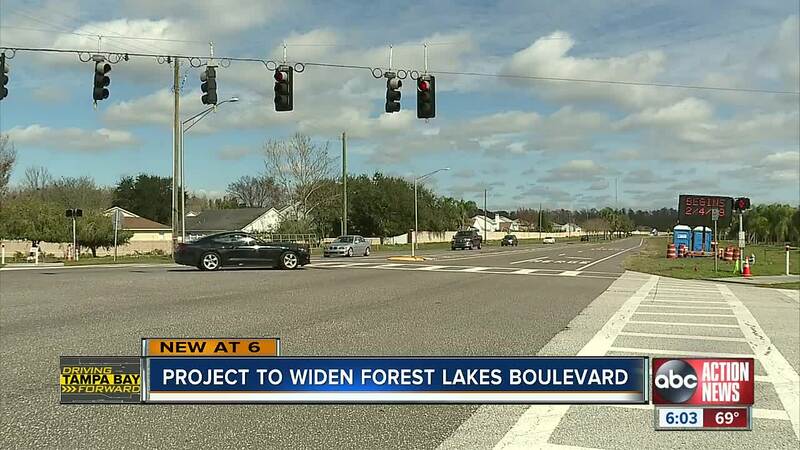 Forest Lakes Boulevard, which runs by homes and business parks alike, will be expanded between Pine Avenue and Race Track Road. There will also be a five foot sidewalk on both sides. Pinellas County officials say Forest Lakes Boulevard is graded with a D as far as its level of service when it comes to vehicle speed, density and congestion. And that’s why Oldsmar’s City Engineer Daniel Simpson says this project needs to be done. “I believe we manage our traffic well in Oldsmar, but there is a lot more cars, there is roadway space,” he said. This project will take about two and half years to finish. During that time there will be some detours and lane closures. “I look at it as going to the doctor. The doctor visit is kind of challenging, but when you are done, you are going to feel healthier,” said Simpson.